This is my friend Kyle. 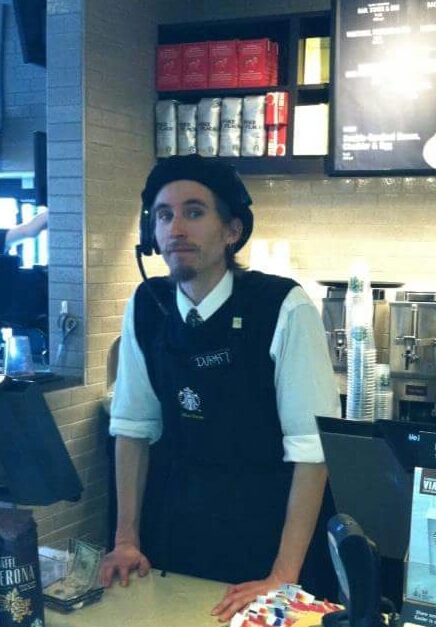 As you may be able to tell he works at one of the Starbucks I frequent. So how does this barista change the world? How can one man serving coffee change the entire world? More to the point what lesson can we take from him that can allow us to do the same? Keep reading for the answers to all these questions and more. Here is one great thing about Kyle, his customer service may be second to none. So does that change the world? In short, yes. Not only does he craft amazing beverages, one of which I am currently enjoying, but he does it with a flair and a kindness far beyond what is asked and expected of him. This is just how Kyle is. He has a good heart and likes to leave people with both a smile and a great drink. So how does being so fun and friendly change the world? The countless number of people that flow through this Starbucks come in all races, shapes and with different stories. Some may be having a great day already and Kyle’s service may just put them over the top. Some may be on the verge of a bad day and having the pleasure of being served by him may turn their day into a great one. Still, the most important thing is there are people who certainly come in contact with Kyle who are having a bad day. They may even be having the worst day they have had. Seeing how much the local employee at the coffee shop cares for them and their order may go a long way into changing their state. They will then be able to react better to those they encounter. It is a ripple effect. Kyle never knows how much his kindness may affect people, and that is not why he does it. Still it has a ripple effect that blesses the lives of a great many people. It may even save the lives of a few who think nobody cares. Feel free to share this post as well as any stories you may have of people you know who change the world. Kindness And spreads. I’m a big fan of random acts of kindness too. It’s important to be a good role model to our children and teach them to also act kindly.